Former Cpl. Abraham Coleman joined the U.S. Army in 1947 at 17, “just to get the hell away from Punta Gorda.” He wanted to find a better life with more opportunities for a young black man than living in a small Southern town. In June 1950, nine days before completing his first three-year hitch in the Army, the North Korean Army charged into South Korea. Their intrusion into the south launched the Korean War and sent Coleman to the Far East once again. He was attached to Company-B, 503rd Field Artillery Battalion, 2nd Infantry Division. He had served three years as an infantryman, but knew nothing about a 155 mm cannon that throws a 96-pound projectile 20 miles. “All of my artillery training was on the front line. As a corporal in an artillery battery, I did a little bit of everything. I cut the charges, helped load the gun and moved the projectile into position,” he said. Coleman’s artillery battery was one of the Allied units that comprised the “Pusan Perimeter.” It was a fortified line of American and South Korean forces who were trying to stop from being pushed into the sea at the southern end of the Korean peninsula by determined enemy forces. Then American Marines landed and changed the tide of war for Coleman and the rest of the beleaguered Army forces. Supreme Commander Gen. Douglas MacArthur put more troops ashore at Inchon, North Korea, and American forces went on the offensive. Several months later, Coleman’s Battery-B and thousands of additional American troops had crossed into North Korea and were fighting along the northern fringes of the country when the pendulum of war began to swing in a hurry in the other direction. “I’ll never forget it; it was Nov. 27, 1950, and we figured we had won the war and were about ready to be sent home,” he said. Then we started hearing bugles. There were bugles blowing behind us, bugles in front of us, bugles everywhere. We couldn’t imagine who was blowing the damn bugles,” he said. By the time his outfit reached Kunuri Pass in North Korea several days later, their big guns were strung out one behind the other as they were being pulled by trucks and half-tracks. “As soon as we got into the pass, the Chinese knocked out the first vehicle and they took out the last vehicle. We couldn’t move backward or forward,” he said. After the .50-caliber machine gun he was manning atop a half-track jammed, he climbed out of the vehicle. He got hit in the back and shoulder by shrapnel from a Chinese grenade. The next day he and what was left of his battery left everything behind on the road and started walking south. Three days later the stragglers met up with soldiers from the 1st Cavalry Division. He ended up recuperating from his shrapnel wounds in a hospital in Yokohama, Japan. 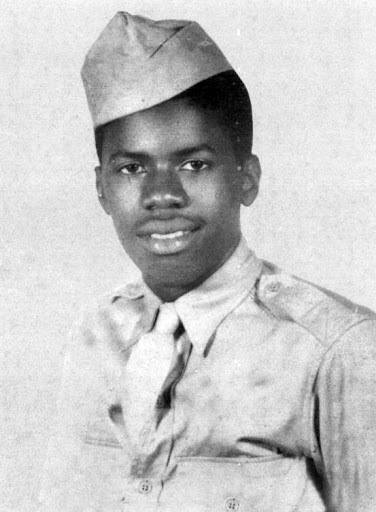 Several months later, Coleman returned to Korea, but this time he was sent to an infantry unit. He became a member of the 9th Infantry battalion, 14th Regiment, 2nd Division. His unit was fighting North Korean and Chinese forces. “We were eating breakfast in a valley when the Chinese came down on us from the hills throwing concussion grenades. One of them hit near me and that was the last thing I remember until I woke up in a Japanese hospital several days later,” Coleman said. He went through months of rehabilitation. When they discharged him from the service, he was listed as 100 percent disabled. He carries an Army identification card that says he is totally disabled from his war injuries. On the way home from war, he took a train from the West Coast to Camp Rucker, Ala., to be discharged. The train stopped in Birmingham, Ala., so the soldiers could eat lunch. “The white soldiers were served lunch in the dining room while the Afro-American soldiers had to eat in the kitchen,” Coleman said with bitter emotions more than 50 years later. The day before he was discharged from the Army, all the infantrymen in his outfit were given their commendations in a formal ceremony. The 21-year-old came home to Punta Gorda and stayed for two years, long enough to get his high school diploma from Dunbar High School in Fort Myers. That was another sore spot with him. He lived a couple of blocks away from then all-white Charlotte High School, but he could not attend because he was black. Coleman returned to Punta Gorda to take care of his widowed mother. He applied for a job at the Punta Gorda Post Office and the Fort Myers Post Office and was denied work even though, he said, there were jobs available at both post offices. Coleman is the first to admit living conditions for black people throughout the United States have greatly improved in the past half-century. 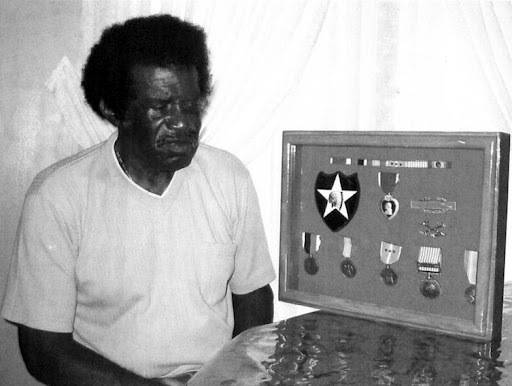 Abraham Coleman is proud of his Army commendations, even though he originally shunned them. During his year of service in the Korean War in 1950-51 he was twice wounded and received two Purple Hearts, three Battle Stars for three major engagements he fought in, a Combat Infantry Badge, a Combat Artillery Badge, a Korean Service Medal and the Korean Occupation Medal. This story first appeared in the Charlotte Sun newspaper on Sunday, July 29, 2007 and is republished with permission. What a story. What strength, bravery and determination. God bless him.